Buddhism was initially established in India and it flourished there during the early phases of its history. After more than 1500 years, the decline of Buddhism in India, caused by several factors, would lead to the virtual extinction of Indian Buddhism by the beginning of the 13th century. Following the reign of King Ashoka (273-232 BCE), Buddhism had prospered quite well throughout India. Up to the 9th century CE, Indian followers numbered in the hundreds of millions. However, Hinduism was strongly ingrained in the minds of the common people, and to this day continues to be the foundation for many customs and daily activities. Buddhism did not have this level of integration, maintaining a separate identity from secular life. Indians, for the most part, included Buddhism as part of Hinduism when it came to the Buddha and various figures of veneration. Shakyamuni Buddha was often revered as one of the gods, and eventually came to be interpreted as a manifestation of the Hindu god Vishnu. However, even though there was integration of ideas, the Buddhist sangha was a separate world from the largely Hindu-based society. 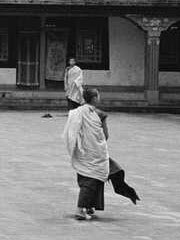 Buddhist monasteries were quite well-funded and life within was relatively easy. To avoid freeloading, many monasteries became very selective about whom they admitted, in some cases based on social class. This further cut off the sangha from Indian society. Indian Buddhism weakened in the 7th century following White Hun and early Islamic invasions such as that of Muhammad bin Qasim. Beyond the direct political effects, these invasions also impeded commercial ties to the west, weakening the merchant classes who tended to sponsor Buddhism . However, Buddhism would enjoy a strong revival under the Pala Empire in the northeast. Mahayana Buddhism flourished under the Palas, between the 8th and the 12th century. However, after the defeat of the Palas by the Hindu Sena dynasty, Buddhism’s position again began to erode. Around 1000 CE, Turkic, Persians and the Afghan Muslims began major incursions into India through the traditional invasion routes of the northwest. Mahmud of Ghazni (979-1030) established a base in Punjab and raided nearby areas. Mahmud is remembered for the ferocity of his attacks on non-Muslim religions. In 1193, Qutb-ud-Din, a Turkish commander, seized control of Delhi, leaving defenseless the northeastern territories that were the heart of Buddhist India. Later that year, raiders under Muhammad Khilji, one of Qutb-ud-Din’s generals, destroyed Nalanda, the great Buddhist library; this event was a major milestone in Indian Buddhism’s suddenly precipitous decline. By the end of the 12th century, following the Islamic conquest of the Buddhist strongholds in Bihar and Bengal, Buddhists ceased to be a significant presence in India. While the exact cause of the decline of Buddhism in India is disputed, it is known that the mingling of Hindu and Buddhist societies in India and the rise of Hindu Vedanta movements began to compete against Buddhism. Many believe that Hinduism’s adaptation to Buddhism resulted in Buddhism’s rapid decline. Particularly important were Hinduism’s revival movements such as Advaita Vedanta and the Bhakti movement, both of which showed the influence of Buddhist thought. Some scholars believe that the influence of Bhakti was synergistic with aggressive Muslim actions, in that Bhakti made conversion to Hinduism a more comfortable alternative for oppressed Buddhists. When Islam arrived in India, it sought conversion from, not assimilation to or integration with, the already present religions.However, because Hinduism was so integral to the character of the Indian people, Islam could not uproot it entirely, even in its lasting impression on converts to Islam. Moreover, the new Muslim rulers left in place the Brahmin-controlled caste system that reinforced Hindu social norms .However, the destruction of many monasteries and stupas resulted in the Buddhist order being almost entirely eradicated, because most of the tradition was kept up by monks, not lay-people. At the beginning of the modern era, Buddhism was very nearly extinct in mainstream Indian society. Some tribal peoples living in the territory of modern India did continue to practice Buddhism. In Bengal, the Bauls still practice a syncretic form of Hinduism that was strongly influenced by Buddhism. There is also evidence of small communities of Indian Theravada Buddhists existing continuously in Bengal in the area of Chittagong up to the present. Buddhism continued to prosper in the nearby countries of Nepal, Tibet and Burma, as well as in more distant locations, such as China and Japan. Buddhism started to decline in India gradually after about 5th century. However it continued to have a significant presence in several regions. Buddhist institutions flourished in eastern India right until the Turkish invasion. It still survives among the Barua, a community of Bengali/Magadh descent that migrated to Chittagong region. Indian Buddhism also survives among Newars of Nepal. In Orissa, Mahima Dharma, a derivative of Buddhism, survived until 18th century. The kayasthas, the community of scribes, in North India, had been a supporter of Buddhism since the early period. They continued to support Buddhism until about 12th-13th century in some regions. It survived in Kashmir valley until 13-14th century, perhaps slighlty longer in the nearby Swat valley. In Ladakh region, adjacent to kashmir valley, Tibetan Buddhism survives. Tibetan Buddhism must have been popular in Kashmir at one time, as we learn from Rajatarangini of Kalhana. In Tamilnadu and Kerala, Buddhism survived until 15-16th century. At Nagapattinam, in Tamil Nadu, Buddhist idols were cast and inscribed until this time. At Nagapattinam, the ruins of the Chulamanipanma Vihar stood until they were destroyed by the Jesuits in 1867. In south in some pockets, it may have survived even longer. The worship of Dharma Shasta may be a relic of Buddhism in Kerala. In recent times, Buddhism has seen a revival in India, partially because of the more liberal laws concerning religion, and also because of the presence of Tibetan Buddhists. Additionally, many people who had felt oppression from the caste system in various parts of India turned to Buddhism, led initially by B. R. Ambedkar in 1956, due to its casteless, more liberal nature.